Burning Man is renowned for its fantastical, massive and ambitious artworks — and yet, this seems to fly in the face of logic, given the challenges inherent in creating art for one of the most remote, forbidding and inhospitable environments on Earth. So how has it come to be that in Burning Man’s history on the Black Rock Desert, artists have consistently pushed themselves to create ground-breaking and mind-blowing art that (for the most part) will only be seen by a subset of a self-selected audience for a single week of the year? Artists coming to Black Rock City enjoy the rare opportunity to create artwork for a truly blank canvas, far from would-be critics, immune to market forces, independent of curators, gallery owners and collectors, and — perhaps most importantly — to be shared with an adoring and appreciative audience. In other words, this is their chance to express themselves as they truly desire, from the heart, unfettered by constraint. Add to this the lack of liability (thanks to the exculpatory language on one’s Burning Man ticket and the community’s agreement to embrace self-reliance), and opportunities for interactive participation in artworks abound. Simultaneously, starting in 2001, the Burning Man organization worked to bring interactive, civic-minded artwork to the world outside of Black Rock City through the Black Rock Arts Foundation (now Burning Man Arts). This has served to enable more people to enjoy more artwork in more places around the world. 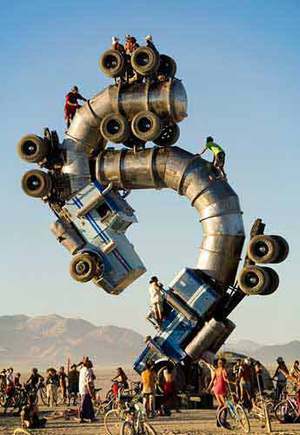 In addition, many large-scale playa art installations are finding temporary homes at other festivals, and several have been purchased by cities and installed as public art. The city of Reno, in particular, has embraced large-scale art from the playa, and has permanently installed several pieces over the years, including Bryan Tedrick’s Portal of Evolution at Bicentennial Park, Kate Raudenbush’s Guardian of Eden in front of the Nevada Museum of Art, Tree Spire by the Iron Monkeys at Whitaker Park, Believe by Laura Kimpton and Jeff Schomberg at City Plaza, the Ichthyosaur Puppet by Jerry Snyder and the Pier Group at the Nevada Discovery Museum, Reno Star by Mark Szulgit at South McCarran and Virginia streets, Gift of Flight by Robert Boyer at the Robb Drive Roundabout, and Pan’s Perch by Ryan Jackson at the River School Farm. Check out this map of the installations. Reno is also installing temporary art, including Gary Gunderson’s Pentamonium at the Lear Theater, and recently opened the Reno Playa Art Park, featuring six smaller interactive sculptures from Burning Man 2016. The Space Whale by The Pier Group with Matthew Schultz, Android Jones and Andy Tibbetts will be installed at Reno’s City Plaza in June 2017. The Space Whale by the Pier Group with Matt Schultz, Android Jones and Andy Tibbetts. Photo by Coloursxart. The San Francisco Bay Area has hosted many art installations, including work from the playa, via our Civic Arts Program. Marco Cochrane’s Truth is Beauty has been installed at the new San Leandro Tech Campus, where it can be seen from the local BART station. Two of Bryan Tedrick’s sculptures, Lord Snort and Coyote, have been installed at the Wilson Winery, on Dry Creek Road in Healdsburg. We’re now seeing art from the playa in other countries; Renaixement, a sculpture by Pink Intruder, has been installed in the Plaza del Doctor Collado, in Valencia, Spain. David Normal’s lightbox art, Crossroads of Curiosity, made for the Souk at Burning Man 2014, was installed at the British Museum in London from June to November 2015. As Burning Man becomes more well-known, its art is springing up far beyond Black Rock City. Take some time to delve into the rich art history of Burning Man.